Teaching Responsibility: When Does it Happen? Now let me explain the short answers above in parenthesis. Two-year-olds are not developmentally ready for responsibility. This does not mean you can’t start teaching responsibility at this age. It means you will create great frustration for yourself and your children if you expect them to “get it” all at once. Think about how children learn to talk. First they hear you talk for a year. Then they say a word, but you don’t expect them to talk in sentences. When they learn to speak in short sentences, you don’t expect a college vocabulary. Children learn responsibility the same way—one step at a time. So often parents are afraid that if they don’t teach their children “responsibility” by the age of two, three, or thirteen, they will be irresponsible adults. How many of you (now responsible adults) were accused of being irresponsible throughout your childhood? It is helpful to remember that, who your children are today, is not who they will be forever. Keep teaching and modeling what you want your children to become as adults, and prepare for individuation along the way. In Positive Discipline we teach, “A misbehaving child is a discouraged child.” However, this is not always the case. Often, what seems like a misbehaving toddler (or older child) is an individuating toddler (or older child)—and is acting age appropriately. In other words, not misbehaving at all. 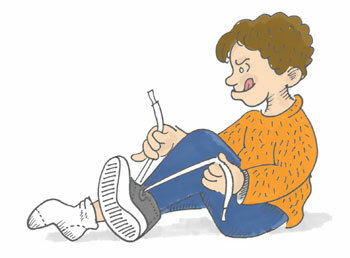 Individuation means that children are constantly experimenting with the questions (at a subconscious level), “Who am I separate from others in my world?” “What kind of power do I have, and how can I use it?” “What works and what doesn’t work?” This experimentation is fairly mild (though annoying to parents) for young children. When they become teens, individuation may be spelled: REBELLION. What does individuation have to do with learning responsibility? If you don’t understand it, you might take it personally and create power struggles. It might help if you remember that, in most cases, your children are not being “defiant” or “irresponsible.” They are testing and experimenting. Individuation is an important developmental process. If kids aren’t allowed to individuate in a kind and firm environment, they will struggle with individuation as adults. It is interesting to note that most parents think the only alternative to controlling children is permissiveness. However, permissiveness is not healthy for children either. Instead try some of the following kind AND firm suggestions. 1. Teach without expecting immediate cooperation. Remember the analogy of how children learn to talk. Learning is a life-long process. 2. Do tasks with children for the first six years. For example, don’t think you can teach your preschoolers to pick up their toys upon command. You may have noticed that sometimes they want to, and sometimes they don’t. When they don’t, they are not being irresponsible. They are being preschoolers who have other priorities and interests (individuation), and who resist being told what to do. How often do you accomplish things that are not on your list of priorities? And, how often do you resist being told what to do. 4. Get agreements in advance. This works best for children over the age of four-years-old (and especially for children over the age of six). When you have spent time together in advance to make an agreement that works for both of you, you can ask, “What was our agreement about mowing the lawn?” This may seem like nagging, but can be very pleasant and loving when you have compassion for the many other issues your teens are dealing with. 5. Create routine charts WITH your children. When children have been involved in the creation of routine charts, they are more likely to follow what they have created—but not always. This is why you need many kind and firm parenting tools. 7. Decide what you will do and follow-through with kindness AND firmness. Stop buying so many toys. I’m amazed at how many toys children have that they don’t play with. They scatter toys, but they don’t play with them. Let kids know in advance that when they don’t pick up their toys, you will; and, when you pick them up they will be put in the garage until they are ready for the responsibility of picking them up. Don’t make this a threat, but a decision upon which you will kindly and firmly follow-through. One clever mother put toys in drawstring bags and hung them on high hooks. Her children could have one bag at a time. Before they could get a different bag, they had to pick up all the toys from the first bag and bring it back for exchange. 8. Have regular family meetings. When children are involved in the problem-solving process they have ownership and are more likely to follow solutions they have helped create. When a solution doesn’t work, try again. If children are too young to participant in family meetings (usually under the age of four), they are too young for “responsibility” in any case. Keep teaching without expecting immediate cooperation. 9. Model what you want. This could be the most important suggestion of all. Be the person you want your children to be. Responsibly control your own behavior before expecting your children to control theirs. And, know that you will sometimes make mistakes—and can learn from them. Don’t expect perfection from yourself or your children. Enjoy the process. 10. Connection before Correction. Remember that children do better when they feel better—so start by making a connection. Validating feelings can make a connection, “I know you don’t want to do this now, and it needs to be done.” Connection can be accomplished by asking, “Do you know how much I love you? How can we work this out so we both win?” An attitude of connection is essential to any Positive Discipline tool. The above suggestions are effective only if you hear the foundation principles underneath each suggestion. When you understand the principles, there are many ways you can use your own creativity to apply them. If you don’t understand the principles, what you do may seem “techniquey” and won’t be effective with children. This is why it is so important to understand child development ages and stages, and then to continually “get into your child’s world” to understand what really works to teach children responsibility.